Round and round and round it goes and where it stops, nobody knows. He doesn’t know it himself. A lunatic classic C-Class driver completely stunned others with an endless spin in the roundabout. Oh, please, somebody stop him! Isn’t he dizzy yet? 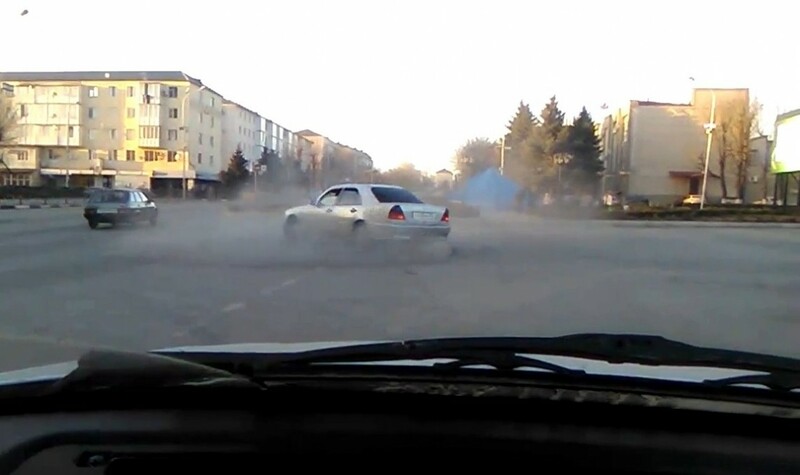 A mad Mercedes driver looked like he could spin forever in a roundabout, somewhere in Russian city. He occasionally flashed at the people who were shooting the video from another car. Other drivers were so shocked that they waited in awe for the mad guy to stop, before even having the courage to set foot or wheel into the roundabout. At least, the lunatic Mercedes driver had the decency to pause for a few seconds and to let them go, while the “movie producers” in the other car were having a laugh at his manners. He resumed show soon after that. We’ve got two reasons for this. He’s either mentally deranged or his car had some technical malfunctions and could not stop the spinning. After watching his foolish act, we tend to believe that the malfunction is in the driver’s head. Daimler’s Dieter Zetsche going to BMW? LinkedIn seems to think so! 4Matic Snowboard – Just don’t push your luck!